I can't believe Seraphina came out over two years ago! 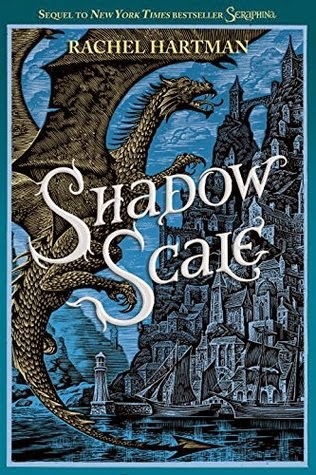 Shadow Scale is a sequel we've waited a long time for and it continues to be one of the most interesting takes on dragons I've ever read. Dragons, who pride themselves on their logic and lack of emotion, have co-existed with humans under a fragile treaty but remain both uneasy of the other's existence. Both sides were unaware of half-human half-dragons like Seraphina until she outed herself, and others like her, to save the kingdom of Goredd and to aid the future king and queen, Lucian and Glisselda. But now a war has broken out between dragons and humans and Seraphina must search for the other half-human half-dragons she's seen in her mind in the hopes they will help. It forces Seraphina to face her past, the kind of power she has and to find out where she belongs. The book begins with a short and sweet prologue that recaps from the first book (so needed this!) and sets the stage for what's to come. There's a lot of adventure and Seraphina must travel all over to find the others. But what really drew me in were the connections Seraphina makes with her fellow half-dragons, her love for her Uncle Orma and her relationships with Glisselda and Lucian (love them both but especially him!). Shadow Scale hits so many emotional notes during moments I didn't expect and that's what moved me about this book. Even though she's supposed to be seeking the others for Goredd, she's also doing it for herself. She travels with Abdo, the young half-dragon who can speak directly into people's minds, and he's one of my favorite characters in the series. His strength and devotion to Seraphina is so heartwarming. Each new half-dragon they find brings interesting characteristics into the fold and I looked forward to the moment when they'd all be together. But in the background is also the love between Seraphina and Lucian. The author handles their relationship incredibly well. It's not some huge drama that overwhelms the book. It's simple: they love each other and they don't want to hurt Glisselda. That's not to say they don't steal a few romantic moments for themselves (truthfully I wanted more!) but the mutual love and respect between Seraphina, Lucian and Glisselda was refreshing to see in a fantasy series that could've easily gone down the overwrought love triangle route so many others do. It takes some time for Seraphina and Abdo to find the others and it does get to a point where it drags. A lot of new characters are introduced, some more effective than others, and I think that portion of the book could've been condensed to the move story along faster. And during this journey, it inevitably leads to questions of their existence (I wish this had come up sooner because it was so interesting!) and it brings Seraphina face-to-face with a half-dragon whose intentions are evil. Even though this half-dragon is the main antagonist, I thought it took up too much of the book. I kept wondering when Seraphina would finally figure out her own true nature to fight back and it basically happens at the last minute. I still love how everything ended but I think it took too long to get there. I do! It's a great fantasy series about dragons and again, the take is really unique. And now that both books are out (today! ), you won't have the 2+ year wait I did. Check it out! Who doesn't love Lucian? (Seriously, who doesn't? Because I will MAKE THEM UNDERSTAND. Ahem.) Anyway, yes to everything you've said about Shadow Scale! I liked it a lot, particularly because the world is expanded and we get to meet more new friends (and enemies). But I also found the pacing a little faulty. Still, it's a great series!